A great Blue Ridge Mountain escape awaits you. Come and enjoy a couple of days or an extended amount of time in the perfect private and secluded mountain getaway. Linwood Lodge provides a great escape from the hectic bustles of life. 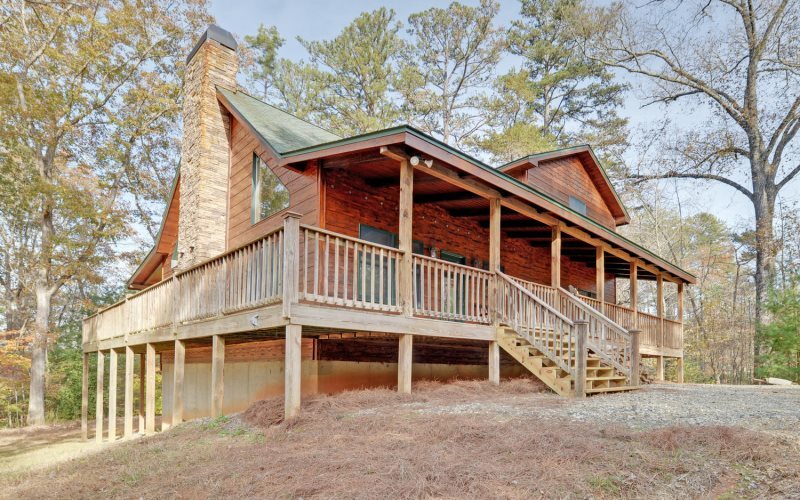 Nestled in the beautiful and tranquil area of Blue Ridge, specifically in Little Sugar Creek Estates, this spacious mountain cabin offers convenient paved access all the way to the cabin's driveway and is located only minutes from the quaint downtown area of Blue Ridge, GA. The privacy oozes from this spacious cabin. Linwood Lodge sits on almost 5 acres of wooded and private land. Neighbors.....nah forget it! The surrounding property is heavily wooded and makes for a great spot for the kids to run around, build forts, and even short hikes all without leaving the property. This gorgeous and super roomy property is designed with family vacationing in mind. This cabin offers a large open concept main floor with a huge floor to ceiling rock wood burning fireplace. The kitchen, dining room, and living room are all open to each other for great family time amongst everyone. Linwood Lodge has four bedrooms and a bunk room that can comfortably sleep twelve. On the main floor are two bedrooms and a full bath, the upper floor houses the master suite, which is one of the largest private suites around and you can “escape” by soaking in the Jacuzzi tub or read a good book on the private screened balcony. In the basement is another bedroom, with an adjoining bunk room. Also, in the basement there is a queen sleeper sofa in front of the second fireplace in the house, with a large tv above. Kids of all ages can enjoy playing video games, pool, air hockey, foos ball or just watch a movie on the flat screen TV in the basement game area. In Linwood Lodge there are plenty of gathering places so no one would be cramped while having the whole crew there. Outside.....once again there are super spaces. The full length and covered back porch, is also wider than most, is a place where many people can congregate and still have plenty of room. In the side yard is a great fire pit, perfect for roasting hot dogs, making smores, or just sitting and relaxing around a crackling fire. So either inside or outside there is plenty of great spaces for the entire family. Location, Location, Location.....The location of Linwood Lodge is perfect because it is only about 5 minutes from downtown Blue Ridge, but you would never know a town was any where nearby. While enjoying all the things that the Blue Ridge area has to offer; unique shops, distinctive eateries, and gorgeous views all around, just knowing that this awesome property is only a few minutes away. Also, this cabin is close to white water rafting, zip lining, horseback riding, tubing, and many hiking trails in the Blue Ridge Mountains. Don’t wait! Think "vacation" and book this beautiful cabin today and enjoy all the Blue Ridge, GA cabin rental area has to offer. The location of Linwood Lodge is absolutely second to none. This North Georgia Blue Ridge Mountain Cabin Rental is located only about 5 minutes from Downtown Blue Ridge, GA. The cabin is in a very private area and sites on almost 5 acres of land, providing great privacy and a wonderful sense of seclusion. With this location the cabin is also close to the USFS, Adventure Trail Rides for Horseback Riding, Blue Ridge Canopy Adventures, downtown Blue Ridge for shopping and dining, Ocoee River white water rafting, Toccoa River Tubing, and Lake Blue Ridge. LINWOOD LODGE is very private and is considered a secluded Blue Ridge Cabin Rental. We came up from Atlanta for my son's 7th birthday, the cabin was very beautiful and spacious, we only regret not staying longer but we plan to return in the future. Everyone I interacted with was friendly and willing to help. It was easy to use. And if there was any problems the staff was available to help. The cabin was incredible. Exceeded my expectations. Will be back again. The cabin as a whole was amazing. The design decor layout. The scenery and property it is on. Check in was great we did not request an early check in, but was able to get checked in by 2:30. Check in staff was very helpful and gave us good suggestions of things to do. Property was in a great location easy to get into town. Very quiet and great for walking around on the property or even on the road in the neighborhood. We enjoyed our stay and would consider staying again. The staff was very kind each time I spoke with them and their communication was excellent. The communication was excellent from beginning to end and our cabin was amazing with no issues. Everyone in our group of 10 loved this cabin. It was clean and spacious. Amenities were great! We would definitely come back. This cabin was beautiful! It was exactly what was shown on the website. It was very spacious for 10 people. We've stayed in cabins in Blue Ridge several times. This was by far the best. It was so easy to get to - not too steep and the roads were paved. It was the perfect place for us! It was just a beautiful cabin. The layout was great, all the furnishings, etc., - just what we were looking for. It was easy to get to. Thank you for your professionalism. You made the process of renting a lodge easy and stress-free. Renting with Georgia Mountain Cabins was easy. We had absolutely no problems. Your website listed everything in the house and suggestions for what we should bring. Directions from the office to the lodge were perfect. Check out instructions were clear. Thank you for an amazing stay! We would definitely rent from you again! The lodge was beautiful. It was clean and carefully decorated. The kitchen was extremely well stocked.The playroom was perfect for kids and teenagers. The master bedroom on the top floor was amazing! Linwood was absolutely amazing. It was very clean and the kitchen was well stocked with everything you would ever need to cook simple to very elaborate meals. The rooms were beautifully decorated and the beds were very comfortable. The washing machine and dryer were a wonderful bonus and were used frequently after our busy days of white water rafting and horseback riding. The teenagers loved the hot tub and the rec room. It was wonderful for them to feel like they had their own private hideaway. We could not have asked for a better vacation home than this. Amber, at the front desk assisted me at both check-in and check-out. I also spoke with her a few times on the phone prior to getting up there. She was super sweet and helpful. She has such a good personality. Just who you want greeting guests. From the very beginning of the process, Georgia Mountain Cabin had a very easy, straightforward website with lots pictures and details so I knew exactly what I was getting. I spoke with the staff a few times over the phone and through email to alter a couple things about my stay and they were extremely accommodating and quick. Check-in and check-out were super easy. Linwood was such a beautiful property with an easy driveway and tons of trees surrounding the house that provided seclusion. We would 10/10 stay here again. Everything was so easy. The property met all of our needs. I wish we would have been able to use the fireplace and hot tub, but we'll save that for our next visit. Linwood was phenomenal. It was very well decorated and provided such a homey feel. I loved the gigantic open floor plan on the main floor. My husband and I j ist got married the weekend before our stay and we had our small family come together up there. If was a great time. We loved the master suite with Jacuzzi tub and awesome shower. Only experience I had was when checking out since we checked in on a Sunday and she was very friendly. Made the entire process of checking in/checking out easy! Also, lots of communication via email. Beautiful cabin with nice upgrades throughout! The fireplaces were wonderful and all the kids enjoyed all the games. Beds were very comfy and loved the master shower!! We would definitely rent this cabin again! Excellent customer service and very friendly staff. We have always had a great experience with Georgia Mountain Cabin Rentals. We love Linwood Lodge! This is our second time staying and had to bring most of the family to experience it for themselves. Great property and I'm sure we will be staying here again in the future. The booking was easy and great customer service. Linwood Lodge is a beautiful home with a lot of property. Our family really enjoyed exploring the property for deer tracks, playing games in the basement. We will definitely be coming back to stay at Linwood Lodge! Every employee I came into contact with was friendly and helpful. Several helpful emails were sent as well from the staff. Loved the cabin. Linwood Lodge is great for families and the location is perfect! We enjoyed our stay. I can't say enough about how helpful Brad was and appreciate everything he did. My college girlfriends and I get together twice a year (we have known each other for over 30 years). Beach vacation and mountain vacation. We love Blue Ridge and the surrounding areas. This is our fourth year in Blue Ridge and our fourth year staying at Linwood Lodge. We LOVE this property, and everything was perfect! We had the most wonderful time. We will be back next year! Great. Cabin was beautiful and kitchen equipped beyond expectations. We brought our dogs with us for the first time and we found the property was perfect for our 3 dogs to enjoy. Our favorite feature was the wrap around deck that had a gate so we could let them roam with no fear of the dogs running off. We were also very appreciative of the staff letting us check in early even though we did not make any previous arrangements since we had the dogs in the car with us and we wanted to get them into the air conditioning as soon as possible.